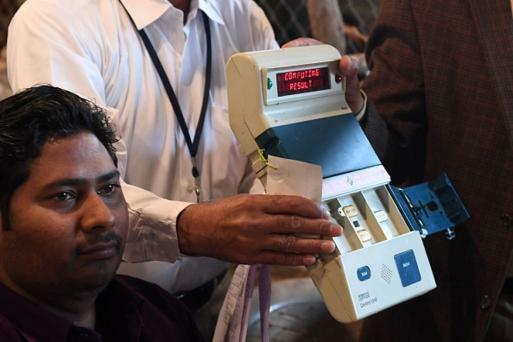 The Election Commission says its open challenge to prove the “non-tamperability” of its Electronic Voting Machines (EVMs) will likely to be held at the end of this month. The poll panel is today meeting the representatives of 55 political parties, 16 of which had urged it to return to ballot papers. "So far there have been 37 cases in various courts regarding EVM tampering. The judgements in 30 of those cases have come and all 30 have been in favour of the EVMs being tamper proof," BJP legislator from Rajouri Garden Manjinder Singh Sirsa said. Sixteen opposition parties had told the Commission that it should revert to the paper ballot system, claiming that the faith of the people has "eroded" in the machines. The EC had trashed the AAP's claim, saying the 'machine is a look-alike and not the ECI-EVM'. Days before the proposed meet, the Aam Admi Party had staged a demonstration on hacking a 'voting machine' in the Delhi Assembly. 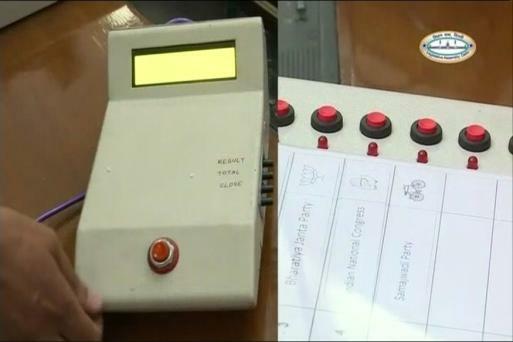 The party had used an EVM prototype to make the demonstration. Digvijaya Singh tweeted: It is the responsibility of Election Commission to convince every Indian that EVM is 100% fool proof and in no case can be tampered. All Party meeting to discuss hacking of EVM appears to be more of an eye wash looking to the schedule fixed by EC. EC must have total transparency on the issue of hacking/cheating in EVM. They must give access to EVM to Techies to prove their point. Impartial Election process is the basic fundamental of a healthy Democracy. It is the responsibility of Election Commission to convince every Indian that EVM is 100% fool proof and in no case can be tampered. Why is Election Commission so rigid about EVM that they are going out of their way to stall the Judicial scrutiny in Uttarakhand HC ? ECI officer made a detailed presentation on EVM security features. Meeting started with inaugural address by Election Commission of India. All 7 National and 35/48 State recognised political parties are attending the meeting. The AAP is firm on its demand for VVPAT machines. “Paper trail machines should be installed. I hope the Election Commission answers all questions. Not only AAP, but 16 political parties have raised the issue,” says AAP’s Saurabh Bhardwaj who had “proved” EVM tampering in the Delhi Assembly. From the BJP, Bhupendra Yadav and GVL Narasimha Rao are scheduled to attend the meeting. “Our stand is clear. We believe in transparency. We are in favour of VVPAT machines being attached to EVMs,” Yadav tells CNN-News18 ahead of the meeting. VVPATs or Voter-Verifiable Paper Audit Trail is a printed slip which tells voters which party and candidate they have voted for. Three representatives from each political party are allowed. From the Aam Aadmi Party, Delhi Deputy CM Manish Sisodia, MLA Saurabh Bhardwaj and minister Gopal Mohan will attend the meeting, reports CNN-News18 Political Editor Sumit Pande. The party has blamed “EVM tampering” for its recent electoral losses. To bolster its claim, Bhardwaj, a former engineer, claimed to have “proved” the “tamperability” of EVMs in the Delhi Assembly this week. It also observed that "it must be possible for the citizen to check the essential steps in the election act and in the ascertainment of the results reliably and without special expert knowledge". "The Election Commission has convened a meeting with all recognised national and state political parties on May 12 in New Delhi to discuss the issue related to EVM and VVPAT. In addition to the EVM/VVPAT, the agenda will also cover making bribery in elections a cognisable offence, disqualification on framing of charges for the offences of bribery in elections and suggestions in VVPAT recount Rules," it had said in a statement last week. Disqualifying candidates named in a charge sheet for bribing voters, making electoral graft a non-bailable offence and easing of rules to order counting of votes through paper trail are some of the other issues Election Commission will discuss with political parties today. Bhardwaj on Tuesday brought a prototype of the EVM to the floor of the House for live demonstration. He cited his experience as a Computer Engineer and said that even he could rig the machine. The meeting comes days after the Aam Admi Party staged a demonstration on hacking a 'voting machine' in the Delhi Assembly. The party had used an EMV prototype for the demonstration. The Election Commission had trashed AAP's claim saying the “machine is a look-alike and not the ECI-EVM”. The date of the proposed challenge would be decided after the all-party meeting. As the political tussle over the use of Electronic Voting Machines (EVMs) heats up, the Election Commission will today meet the representatives of 55 political parties, 16 of which had urged it to return to ballot papers. The Election Commission has convened the meeting of seven national and 48 state parties to discuss the reliability of EVMs and is also likely to brief them on its planned EVM hacking challenge.